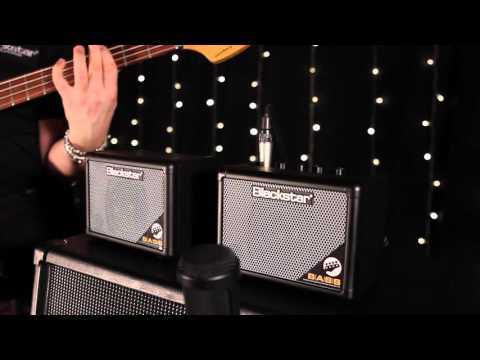 The Blackstar FLY 3 Bass is a compact, innovative mini amp with big TONE. Combining two channels, a continuously variable mid-cut EQ, Sub control and compressor, it’s the perfect take-anywhere bass amp. FLY 3 Bass is a compact, innovative mini amp that that gives you huge tone on the go. Combining two selectable channels, a continuously variable mid-cut EQ, Sub bass and a compressor for ultimate control over your dynamics; it’s the perfect take-anywhere amp for your bass guitar, phone or tablet. The FLY 3 Bass also comes with an MP3 / LINE IN jack built-in, allowing you to connect to your MP3 player, mobile phone, laptop, tablet etc. and jam along to your favourite tracks; the Speaker Emulated Output jack can also be used with headphones or for recording. You can combine the FLY 3 Bass with the FLY 103 to create a 6 Watt stereo bass guitar amp set-up. The pair of them linked together create one an amazing portable speaker system, for your PC or computer speakers to play your music through. Dimensions: 126 x 170 x 102 mm.